Low and slow… it’s true for sous vide, and its definitely true for smoking. And, if you live in Seattle, you probably know that one of the worlds best smoked foods is salmon. 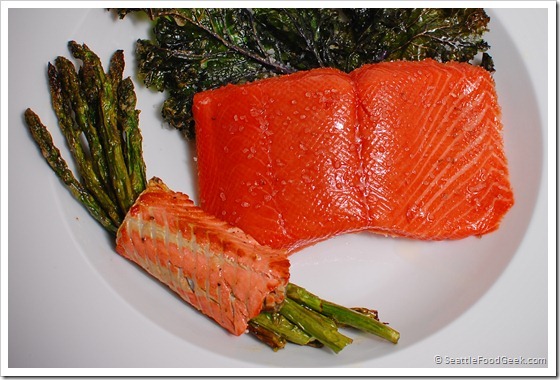 Smoked salmon has a wonderfully rich and concentrated flavor, but unfortunately it also has the texture of wet leather. For this recipe, I used a Smoking Gun – a remarkable little device that creates a cold, concentrated smoke that can be captured in a container, or in this case, a vacuum bag [Disclosure: the Smoking Gun I used was a demo unit provided by PolyScience.] The result: instant smoky flavor. Then, we delicately cook the salmon to just above rare, which retains the fish’s buttery texture. Remove the skin from the salmon fillets (reserve for frying, if you want.) Divide the salt and pepper between the fillets and coat both sides. Place the fillets, together or individually) into vacuum seal bags, but don’t seal them yet. Prepare an ice bath large enough for the salmon fillets in their bags. Load a Smoking Gun with hickory wood shavings. Insert the exhaust hose into the open end of the bag and fold over the open edge to partially seal the bag. Turn on the Smoking Gun and light the wood chips. Smoke the entire bowl into the bag, retaining as much smoke as possible. Holding the open end of the bag up, submerge the bag into the ice bath for a few seconds to condense the remaining smoke. 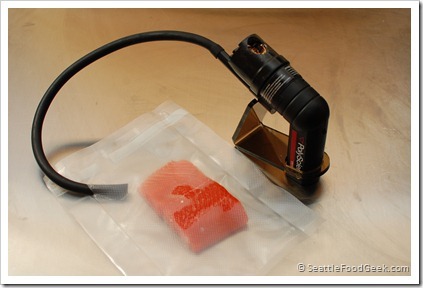 Seal the open end in the vacuum sealer. Cook the salmon in the water bath for 15 minutes. Remove and serve. Given the soft texture of the salmon, I thought it would be good to pair it with something crunchy. I fried kale leaves in grapeseed oil for a few seconds per side (look out for major oil splatter!) and roasted asparagus with olive oil and rosemary salt. I also fried the leftover salmon skin until it was slightly crispy and used it to wrap the asparagus. This is one of my new favorite salmon preparations, and I can’t wait to see what else I can instant-smoke! can i get info on the changes in tunan,salmon and cod at different temperature during sous vide pls?